We would like to say a massive thank you to Patsy Hallmey and the Dorset Children's Foundation and to everyone who raises money for such an amazing charity. Amabel has very complex medical needs. In January, Amabel had major spinal surgery to correct the 100 degree curve to her spine that her severe spasticity had caused over the years. She had metal rods inserted down the length of her spine. 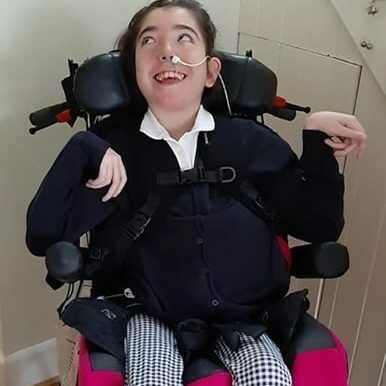 She also had an intrathecal baclofen pump inserted to help reduce her spasticity and reduce the likelihood of her developing any more postural difficulties. She came through the surgery amazingly and has done incredibly Well. It was imperative post surgically for her to have the best wheelchair available that offered both support and comfort. The Dorset Children's Foundation kindly funded this amazing chair. Ama finds it so comfortable and it keeps her in the best position possible. It can also recline until it is almost flat to enable her to rest when she needs to. We can't thank the Dorset Children's Foundation enough and also a special thank you to Patsy who just makes everything so easy. We would like to say a massive thank you to Patsy Hallmey and the Dorset Children's Foundation and to everyone who raises money for such an amazing charity. Amabel has very complex medical needs. In January, Amabel had major spinal surgery to correct the 100 degree curve to her spine that her severe spasticity had caused over the years. She had metal rods inserted down the length of her spine. She also had an intrathecal baclofen pump inserted to help reduce her spasticity and reduce the likelihood of her developing any more postural difficulties. She came through the surgery amazingly and has done incredibly Well. It was imperative post surgically for her to have the best wheelchair available that offered both support and comfort. The Dorset Children's Foundation kindly funded this amazing chair. Ama finds it so comfortable and it keeps her in the best position possible. It can also recline until it is almost flat to enable her to rest when she needs to. We can't thank the Dorset Children's Foundation enough and also a special thank you to Patsy who just makes everything so easy.